Death Mills, dir. Billy Wilder (USA, 1945). Majdanek – cmentarzysko Europy, dir. Aleksander Ford (Poland, 1945). Nazi Concentration Camps, dir. George Stevens (USA, 1945). The Nazi Plan, dir. George Stevens (USA, 1945). Jasenovac, dir. Gustav Gavrin & Kosta Hlavaty (Yugoslavia, 1945). Memory of the Camps, dir. Alfred Hitchcock (UK, circa 1946). Seeds of Destiny, dir. Gene Fowler Jr. (USA, 1946). Nous Continuons [mir lebn do], dir. Moshe Bahelfer, O. Fessler, A. Hamza, I. Holodenko, J. Weinfeld (France, 1946). The Nuremberg Trials, dir. C Svilov (USSR, 1947). 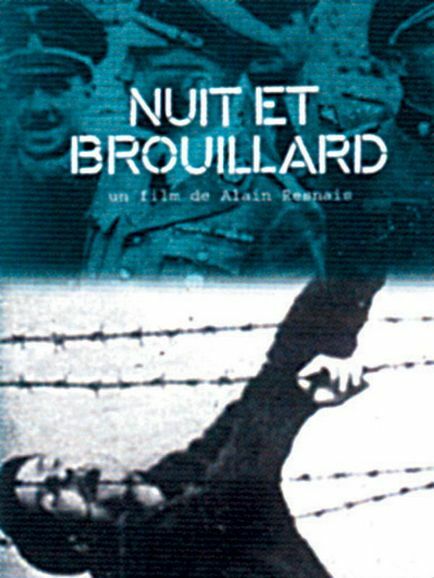 Nuit et brouillard, dir. Alain Resnais (France, 1955). Der vorletzte Akt, Walter Krüttner (Germany, 1965). Memorandum, dir. Donald Brittain and John Spotton (Canada, 1965). Obyknovennyy fashizm, dir. Mikhail Romm (USSR, 1965). Warsaw Ghetto, BBC documentary (UK, 1966). Mordere iblandt os (TV), dir. Henning Knudsen (Denmark, 1967). The Rise and Fall of the Third Reich, dir. Jack Kaufman (USA, 1968). Archeologia, dir. Andrzej Brzozowski (Poland, 1968). Le chagrin et la pitié, dir. Marcel Ophüls (France / Switzerland / West Germany, 1969). Dingen die niet voorbijgaan, dir. Philo Bregstein (Netherlands, 1970). The 81st Blow, dir. David Bergman, Jacques Ehrlich and Haim Gouri (Israel, 1974). The Memory of Justice, dir. Marcel Ophüls (UK / USA / France / West Germany, 1976). The Holocaust – The story of family Weiss (USA, 1978). Der gelbe Stern, dir. Dieter Hildebrandt (Germany, 1980). The Hunter and the Hunted, dir. John Oakley (Australia, 1981). Genocide, Arnold Schwartzman (USA , 1982). The Story of Chaim Rumkowski and the Jews of Lodz, dir. Peter Cohen and Bo Kuritzen (Sweden, 1982). Who Shall Live and Who Shall Die, dir. Laurence Jarvik (USA, 1982). To Bear Witness, dir. Gavin P. Boyle (USA, 1983). Schindler: The Documentary (TV), dir. Jon Blair (UK, 1983). The Work, Bernard Offen (USA, 1983). A Generation Apart, dir. Jack Fisher (USA, 1984). Kaddish, dir. Steve Brand (USA, 1984). Babiy Yar: Lessons of History (USSR, 1985). Die Befreiung von Auschwitz, dir. Irmgard von zur Mühlen (Germany, 1985). Goethe in D, dir. Manfred Vosz (Germany, 1985). Shoah, dir. Claude Lanzmann (France, 1985). The Ties That Bind, dir. Su Friedrich (USA, 1985). Partisans of Vilna, dir. Joshua Waletzky (USA, 1986). B’Glal Hamilhamah Hahi, dir. 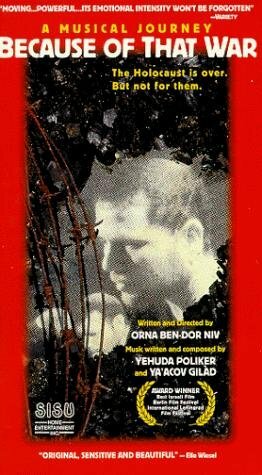 Orna Ben-Dor Niv (Israel, 1988). Hôtel Terminus: Klaus Barbie, sa vie et son temps, dir. Marcel Ophüls (USA/France, 1988). Mit 22 Jahren wollte man noch nicht sterben, dir. Rainer Ritzel (Germany,1988). Témoins, dir. Marcel Lozinski (France/ Poland, 1988). Voices from the Attic, dir. Debbie Goodstein (USA, 1988). Hugo, dir. Yair Lev (Israel, 1989). Lodz Ghetto, dir. Alan Adelson & Kate Taverna (USA, 1989). The Architecture of Doom, dir. Peter Cohen (Sweden, 1989). C.A.N.D.L.E.S. : The Story of the Mengele Twins (TV), dir. Gordon J. Murray (USA, 1990). Premier convoi (TV), dir. Jacky Assoun and Suzette Bloch (France, 1991). Purple Triangles, dir. Martin Smith (UK, 1991). Chasing Shadows, dir. Naomi Gryn (UK, 1991). A Day in the Warsaw Ghetto: A Birthday Trip in Hell, dir. Jack Kuper (Canada, 1991). They Risked Their Lives: Rescuers of the Holocaust, dir. Gay Block (USA, 1991). Sequel to Lódz Ghetto, dir. Alan Adelson (USA, 1992). Miejsce urodzenia, dir. Paweł Łoziński (Poland, 1992). La rafle du vel-d’hiv, la marche du siècle, dir. William Karel (France, 1992). The Visas That Saved Lives, dir. Alan Adelson (Japan, 1992). Återkomster, dir. Joanna Helander and Bo Persson (Sweden, 1992). Children of the Shadows, dir. Marc Cukier (Canada, 1993). Balagan, dir. Andres Veiel (Israel/ Germany, 1994). Diamonds in the Snow, dir. Mira Reym Binford (USA, 1994). Choosing One’s Way: Resistance in Auschwitz/Birkenau, dir. Ted Kay and Allen Secher (USA, 1994). Die Kunst des Erinnerns – Simon Wiesenthal, dir. Johanna Heer and Werner Schmiedel (Austria, 1994). La memoria del agua, dir. Héctor Fáver (Spain/ Argentina, 1994). The Power of Conscience: The Danish Resistance and the Rescue of the Jews, dir. Alexandra Isles, (Unknown, 1994). Tzedek, dir. Marek Halter (France/ Switzerland, 1994). Anne Frank Remembered (TV), dir. Jon Blair (USA/ UK/ Netherlands, 1995). Bottles in the Cellar, dir. Shmuel Imberman (Israel, 1995). Children Remember the Holocaust (TV), dir. Mark Gordon (USA, 1995). One Survivor Remembers (TV), dir, Kary Antholis (USA, 1995). Reshimot Vanda (TV), Vered Berman (Israel, 1995). Rhodes nostalgie (TV), dir. Diane Perelsztejn (Belgium, 1995). Drancy Avenir, dir. Arnaud des Pallières (France, 1996). Nuremberg, dir. Stephen Trombley (UK, 1996). Survivors of the Holocaust, dir. Allan Holzman (USA, 1996). The Nazis: A Warning from History, dir. Laurence Rees and Tilman Remme (UK, 1996). The Island on Bird Street, dir. Søren Kragh-Jacobsen (Denmark/ UK/ Germany, 1997). Blood Money: Switzerland’s Nazi Gold, dir. Stephen Crisman (USA, 1997). Grüningers Fall, dir. Richard Dindo (USA, 1997). My Hometown Concentration Camp, dir. Bernard Offen (USA, 1997). In the Shadow of the Reich: Nazi Medicine, dir. John Michalczyk (USA, 1997). Journal de Rivesaltes 1941–1942, dir. Jacqueline Veuve (Switzerland, 1997). The Long Way Home, dir. Mark Jonathan Harris (USA, 1997). The Lost Children of Berlin, dir. Elizabeth McIntyre (USA, 1997). Out Loud!, dir. Miriam Bjeirre (USA, 1997). Das Prinzip Dora, dir. Claudette Coulanges and Rolf Coulanges (Germany, 1997). Raising the Ashes, dir. Michael O’Keefe (USA, 1997). Shahor Lavan Zeh Tzivoni, dir. Tamir Paul (Israel/ Czech Republic, 1997). The Trial of Adolf Eichmann, dir. various for PBS (USA, 1997). Un vivant qui passé, dir. Claude Lanzmann (France/ Germany, 1997). Unterwegs als sicherer Ort, dir. Dietrich Schubert (Germany, 1997). Vankileirien paratiisi, Lisa Hovinheimo (Finland, 1997). Diese Tage in Terezin, dir. Sibylle Schönemann (Germany/ Czech Republic, 1998). Fotoamator, dir. Dariusz Jablonski (Germany/ France/ Poland, 1998). The Last Days, dir. James Moll (USA, 1998). A Letter Without Words, dir. Lisa Lewenz (USA, 1998). Nachrichten aus dem Untergrund, dir. Andreas Hoessli (Switzerland, 1998). Never Forget, dir. Sherrie Drummond (USA, 1998). A Sculpture of Love and Anguish: The Miami Beach Holocaust Memorial, dir. David Braman (USA, 1998). Burning Questions, dir. Michael Porembski (USA, 1999). The Children of Chabannes, dir. Lisa Gossels (USA, 1999). Children of the Night, dir. Jolanta Dylewska (Switzerland, 1999). Eyewitness, Bert Van Bork (USA, 1999). Flucht in den Dschungel, dir. Michael Juncker (Germany, 1999). Hidden Heroes, dir. Karen Pascal (Canada, 1999). Martin, dir. Ra’anan Alexandrowicz (Switzerland/ Israel, 1999). Mr. Death: The Rise and Fall of Fred A. Leuchter, Jr., dir. Errol Morris (USA/ UK, 1999). Process B-7815, dir. Bernard Offen (USA, 1999). Tak for Alt: Survival of a Human Spirit, dir. Laura Bialis & Broderick Fox & Sarah Levy (USA, 1999). Un spécialiste, portrait d’un criminel moderne, dir. Eyal Sivan (Israel/ France/ Germany/ Belgium/ Austria, 1999). Witness: Voices from the Holocaust, dir. Joshua M. Greene & Shiva Kumar (1999). … gdzie jest mój starszy syn Kain, dir. Agnieszka Arnold (Poland, 1999). Auschwitz: The Final Witnesses, dir. Sheldon Lazarus (UK, 2000). Cerca del Danubio, dir. Felipe Vega (Spain, 2000). Fighter, dir. Amir Bar-Lev (USA, 2000). Typhoons’ Last Storm, dir. Lawrence Bond (USA, 2000). Hazehut Ha’Avuda Shel Hanita, dir. Vered Berman (Israel, 2000). 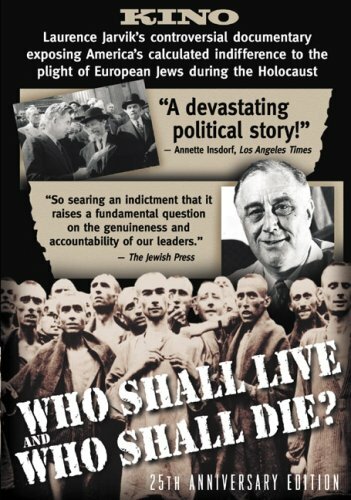 The Holocaust on Trial, dir. Leslie Woodhead (UK, 2000). Into the Arms of Strangers: Stories of the Kindertransport, dir. Mark Jonathan Harris (UK/ USA, 2000). Paragraph 175, dir. Rob Epstein and Jeffrey Friedman (USA, 2000). Reshimat Ahava, dir. David Fisher (Israel, 2000). Exodus to Berlin, dir. Jeff Kamen and Peter Laufer (USA, 2001). Holocaust: New York Tolerance Center, dir. Scott Goldstein (USA, 2001). Eine Liebe in Auschwitz, dir. Thilo Thielke (Germany, 2001). Śmierć Zygelbojma, dir. Dżamila Ankiewicz (Poland, 2001). Sąsiedzi, dir. Agnieszka Arnold (Poland, 2001). Sobibor, 14 octobre 1943, 16 heures, dir. Claude Lanzmann (France, 2001). Struma, dir. Radu Gabrea (Canada, 2001). Svedok, dir. Dušan Hudec (Slovakia, 2001). Illusion, dir. Michael Goorjian (USA, 2002). Last Dance, dir. Mirra Bank (USA, 2002). Pamiętam, Marcel Lozinski (Poland, 2002). Prisoner of Paradise, dir. Malcolm Clarke and Stuart Sender (USA/ Canada/ Germany/ UK, 2002). Sudbina mi nije dala da odem, dir. Dominik Sedlar and Jakov Sedlar (USA, 2002). Undying Love, dir. Helene Klodawsky (Canada, 2002). Berga: Soldiers of Another War, dir. Charles Guggenheim (USA, 2003). Den Danske løsning, dir. Karen Cantor and Camilla Kjærulff (USA/ Denmark, 2003). Long Shadows: Stories from a Jewish Home, dir. Kate Hampel (Australia, 2003). Luboml: My Heart Remembers, dir. Eileen Douglas and Ron Steinman (USA, 2003). A Is for Auschwitz: A Weekend with My Grandparents (USA, 2004). Against the Odds, dir. Jedrzej Jonasz (Canada, 2004). Imaginary Witness: Hollywood and the Holocaust, dir. Daniel Anker (USA, 2004). Paper Clips, dir. Elliot Berlin and Joe Fab (USA, 2004). La fuga degli innocenti, dir. Leone Pompucci (Italy, 2004). Auschwitz: The Nazis and the ‘Final Solution’ Also known as Auschwitz: Inside the Nazi State, dir. Dominic Sutherland, Martina Balazova and Detlef Siebert (UK, 2004). The Ninth Day, dir. Volker Schlöndorff (Germany, Luxembourg, Czech Republic, 2004). Holocausto: Tercera Generación, dir. Daniel Segal, Daniel Halpern (Chile, 2005). 2 oder 3 Dinge, die ich von ihm weiß, dir. Malte Ludin (Germany/ Slovakia, 2005). Process (TV), dir. Péter Muszatics (Hungary, 2005). A Treasure in Auschwitz (TV), dir. Yahaly Gat (Israel, 2005). Wenn lang die Bilder schon verblassen… KZ Theresienstadt – Propagandafilm und Wirklichkeit, dir. Thilo Pohle (Germany, 2005). Amants des homes, dir. Isabelle Darmengeat (France, 2006). Borrowing Time, dir. Robert Allan Black (USA, 2006). Journey to Justice, dir. Steve Palackdharry (USA, 2006). Knocking, dir. Joel Engardio and Tom Shepard (USA, 2006). La Strada di Levi, dir. Davide Ferrario (Italy, 2006). Der letzte Zug, dir. Joseph Vilsmaier and Dana Vávrová(Germany, 2006). The Counterfeiters, dir. Stefan Ruzowitzky (Austria/ Germany, 2006). Kz, Rex Bloomstein (UK, 2006). Auschwitz, dir. Uwe Boll (Germany, 2011). In Darkness, dir. Agnieszka Holland (Poland, 2011).